We have been overwhelmed by the outpouring of love and support from the community. Unfortunately, our insurance will not cover the product, flock of 200 layers or the farm property that was housed in the barn, which was literally every piece of equipment we owned. There is a lot of work to be done and the cost keeps climbing! Once we learned that our insurance will not cover any of the loss beyond the barn itself we realized that the GoFundMe‘s original goal will not be enough. The page remains up and able to accept donations which is wonderful, though I expect most folks see that the goal has been reached and feel we are ok. There are a few other ways you can support us, and we would be deeply grateful if you could help us share the news! 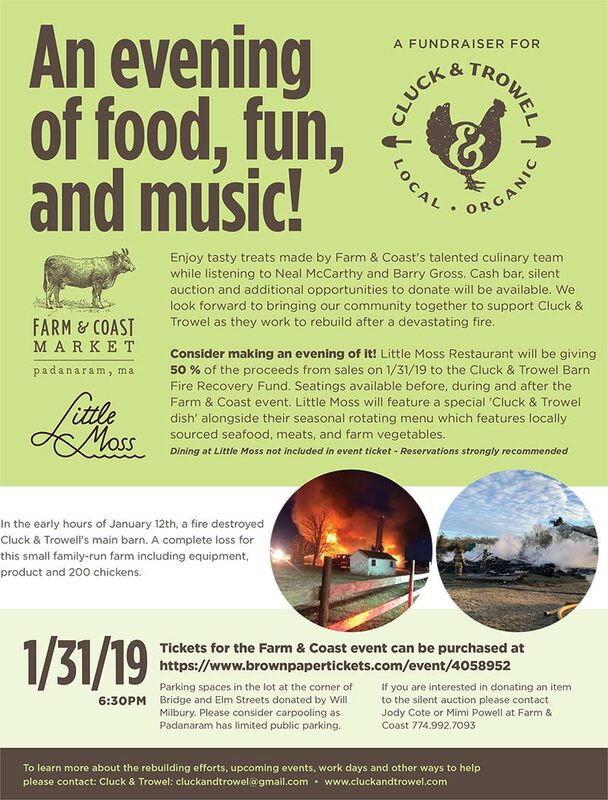 Farm & Coast Market 7 Bridge Street in Padanaram Village (South Dartmouth) is hosting an evening of food fun and music on 1/31/19 beginning at 6:30 pm there will be food, music by Neal McCarthy and Barry Gross as well as a cash bar and silent auction. Tickets are $25 and are available here. Ryan Wagner will host a “Hootenanny” at his Weatherlow Farm on Sodom Rd in Westport on 2/23/19. We are ironing out the details but tickets should be available starting next week. There will be food, music and lots of fun! Depending on the response we may have a silent auction at that event as well. My wife started the “Farmer Film and Potluck Series” at the Dartmouth Grange. The final Film & Potluck of this season will be on March 1st. The evening will feature Farmers For America, an independent film by Graham Merriweather who will be on hand to talk about the film and what he has learned about farming and our food system here in America. View the trailer here. We are currently working to sort out how we will move forward for the upcoming season. We have to replace literally every tool we owned, including tractors/tillers and all of our electric fencing and fence charges as well as a million other things that I will not bore you by listing! We are confident that we will find the path forward and that our farm and family will be stronger and better than ever before. There is a lot of work between there and here! If you want to stay connected please consider following us on Facebook, Twitter, and Instagram. We would also be happy to add you to our mailing list. 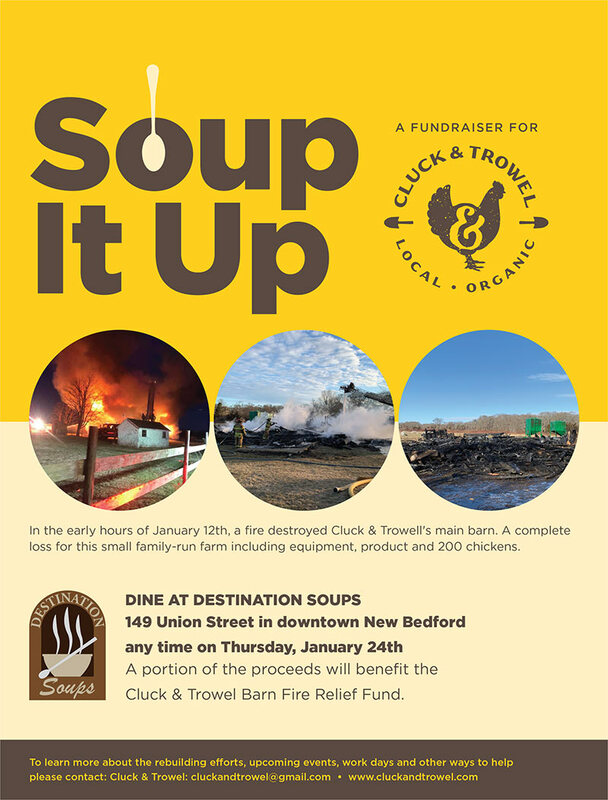 You may have heard that local farm Cluck & Trowel recently had a devastating barn fire. But we are happy to report that they will be at the Pawtucket Wintertime Farmers Market tomorrow — Saturday, January 19 — selling the eggs and frozen chickens they still have. Find them near the front of the Yellow Hallway (999 Main St entrance to the market), next to Hill Orchard’s stand. Come out to support them if you can this Saturday! And visit their GoFundMe page to donate to their recovery fund. In the early hours of January 12th, Sarah Cogswell left her house to get ready for a farmers’ market, only to find her barn ablaze. Fire crews from Dartmouth and the surrounding communities battled the intense fire for 4 hours, but the barn was a complete loss. Sarah along with Kate Levin own and run Cluck and Trowel, a small family farm in Dartmouth and Westport, MA. It is a certified organic farm raising pastured poultry and heritage pork as well as a variety of seasonal produce. Sarah and Kate lost over 200 laying hens, a brand new chest freezer full of their pork they were selling at farmers’ markets, and all of the equipment that they were storing in the barn for the winter. Sarah and Kate are headed into their fourth season farming at this location and were planning on expanding this season. Even before starting Cluck and Trowel, Sarah and Kate were an integral part of the local farming community. They are active members of the Dartmouth Grange and they are always ready to help anyone in their community that needs it. Please help us get Sarah and Kate back on their feet and continue to farm. 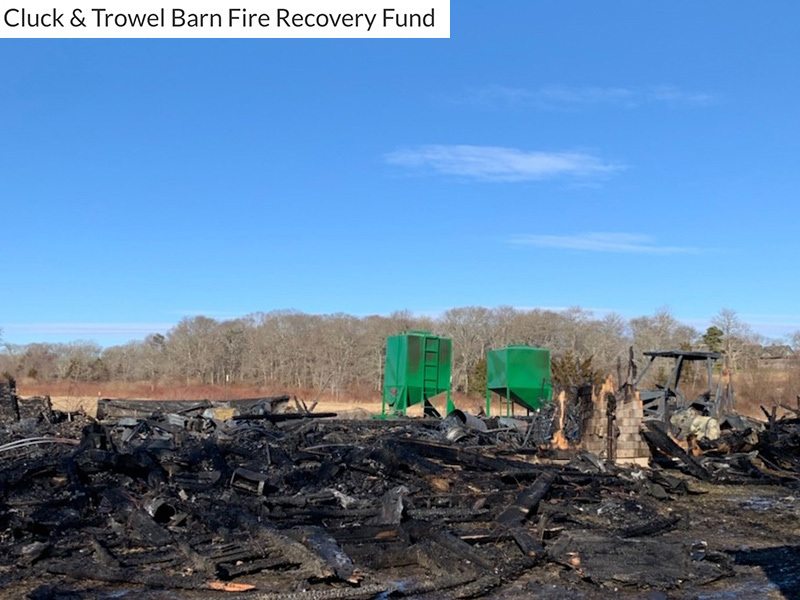 All funds raised will go directly to Sarah and Kate to help replace the equipment they lost in the fire and to try and rebuild their flock of chickens.